For fans of sci-fi, for fans of 80’s and 90’s television, for toy buffs, and for fans of fantasy/adventure cartoons — FINALLY after nearly 20-years! 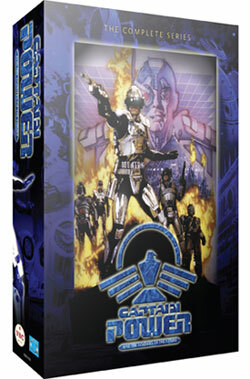 — the complete Captain Power And The Soldiers Of The Future 4-DVD set, and the complete Skeleton Warriors complete 2-DVD set, will be available on December 6th, 2011! Loaded with hefty special features and behind the scenes documentaries, these DVD sets are bringing back all the sci-fi action and adventure that made these shows so memorable! 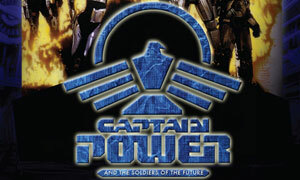 Captain Power And The Soldiers Of The Future was the first TV series to integrate live action, CGI, and interactive effects back in 1987-88. A groundbreaking achievement at a cost of nearly one million dollars per episode, the show paved the way for innovations in technology now used everywhere. The show was intended to appeal to an adult audience just as much as for children, but it still sparked controversy for its mature storylines and sophisticated writing. The series takes a look at a future where mechanized warfare and technology results in the subjugation of organic life by artificially intelligent machines. In a bold move, the show’s creative team even allowed for the death of one of its main heroes, which alarmed parents’ groups in the 1980s and led to the show’s cancellation after only one season. Set in the year 2147, the show follows the struggle of an elite group of humans lead by Jonathan Power, armored in specialized bio-suits, they are mankind’s last defense against the onslaught of the mechanized Bio-Dread warriors and the evil Lord Dread! DVD producer and special features director Roger Lay Jr. (Ray Bradbury’s Chrysalis, Toy Masters), scoured the countryside to track down the original tape masters in vaults from Canada to California to New Jersey! All 22 Episodes from the first and only season of Captain Power, will be presented in stunning visual clarity with the 4-DVD set. The set will also include a brand-new feature length documentary, Out Of The Ashes: The Making Of Captain Power that gives fans an inside look at the series. * Cast and Crew Commentary featuring creator Gary Goddard and stars Tim Dunigan & Jessica Steen. * Captain Power Season 2: Declassified — a featurette about the show’s unproduced second season. * Captain Power: The Legend Begins — a feature-length TV movie, never before aired in the US! Also to be released on December 6, the complete episodes 2-DVD set of another Gary Goddard creation, the animated series: Skeleton Warriors! The animated cartoon, which ran for 13 episodes as part of CBS’ Saturday morning lineup, follows the struggle of Prince Lightstar and The Legion of Light, defenders of the planet Luminaire from the ghastly Baron Dark and his evil Skeleton Warriors! * Bad to the Bone: The Making of Skeleton Warriors — a 45 minute documentary on the origins and development of the show. * Audio Commentary on Select Episodes with creator Gary Goddard and coproducer Robert DeLapp. * Galleries of Concept Art. – AND MORE! For more information and to keep up with the latest news, follow on Facebook!